The Jaguar XF was originally launched for the 2008 model year, replacing the aging Jaguar S-Type sedan. Where the S-type had retro styling, the XF was a modern, forward-looking design, befitting the era. Yet the XF was still a product of Ford’s Premier Automotive Group, and shared a substantial amount of DNA with the S-type and some Ford models. A facelift for the 2011 model year gave us a clue of what Jaguar had in mind, but the full flower of the XF had to wait for this year to blossom. Jaguar has been on a roll with new cars over the past few years, with the F-Type providing the halo and the design language that’s rolling through the brand. In addition to the all-new XF, we’ve seen the smaller XE sedan and the beautiful F-Pace crossover join the line in 2015/6. Jaguar expects to nearly triple its global sales volume primarily on the strength of these three related models. So it’s fair to take a deep look at the XF to see what Jag is bringing to market. It starts with the new chassis. Like all automakers, Jaguar needs to keep things light to meet increasingly stringent fuel economy standards and the performance demands of its customer base. With the launch of the new XF, Jaguar’s entire line is now made primarily of aluminum. There’s still some high-strength steel in there, but only where it needs to be to provide a rigid chassis. That’s in the rear longitudinal chassis support members and the B-pillar rollover structure. The bulk of the unibody chassis is made from aluminum alloy stampings mated to extruded or die-cast chunks of aluminum and magnesium. These are welded, riveted, and sealed together to result in a complete structure that is 28 percent stiffer than the outgoing XF. Getting back to lightness, the one-piece side skin panels weigh just under 6kg apiece. The result is a mid-large luxury sedan that weighs in at 1 710kg, where the last generation XF often weighed in at over 1815kg. Advanced aluminum chassis and bodywork is great, but you can get that in almost any bakkie these days. The real beating heart of a Jaguar has always been, and always should be, the engine. Jag is moving with the times, dropping both the entry-level four-cylinder and the old 5.0-liter supercharged V8 in favor of a pair of 3.0-liter supercharged V6 engines shared with the F-Type. The basic XF engine now delivers 340 horsepower and 436Nm of torque, while the upgrade XF S engine boosts you to 380 horsepower and the same 450Nm of torque. If there was one real head-scratcher about the new XF, this is it. Why bother creating an upgrade engine that isn’t really much of an upgrade? The base rear-drive XF gets you from 0 to 100kph in a quick 5.2 seconds, and the XF S engine shaves only 0.1 seconds off that time. The AWD XF is a little better, with the base engine doing the 0 to 100 test at 5.1 seconds and the XF S engine making 5.0 seconds. But 0 to 62 times are identical across all the models at 5.3 seconds. Top speed is also the same, governed to 250kph. You get the same eight-speed automatic transmission in all XF models. Let’s be clear – the engine in the XF is fantastic. It’s a great unit with all kinds of get-up-and-go. You’ve got power off the line, power to pass, and plenty of great engine sounds. It’s just that the XF S engine doesn’t give you appreciably more than the base unit. So why would anyone choose the more expensive XF S? The XF S provides only a few benefits over the R-Sport, mainly the Adaptive Dynamics active ride control shock absorbers and some trim pieces. The R-Sport gets you LED headlights, blind spot monitoring, lane keep assist, driver condition monitoring, and reverse traffic monitoring. So there are a lot of great features to be had, but the extra power of the XF S engine isn’t really one of them. Here’s another great truth: Jag buyers want it all. Engine power is a given for all modern luxury cars, but Jag owners demand great handling as well as an unmatched interior experience. The XF delivers on all counts, but maybe a bit too much for some luxury shoppers. 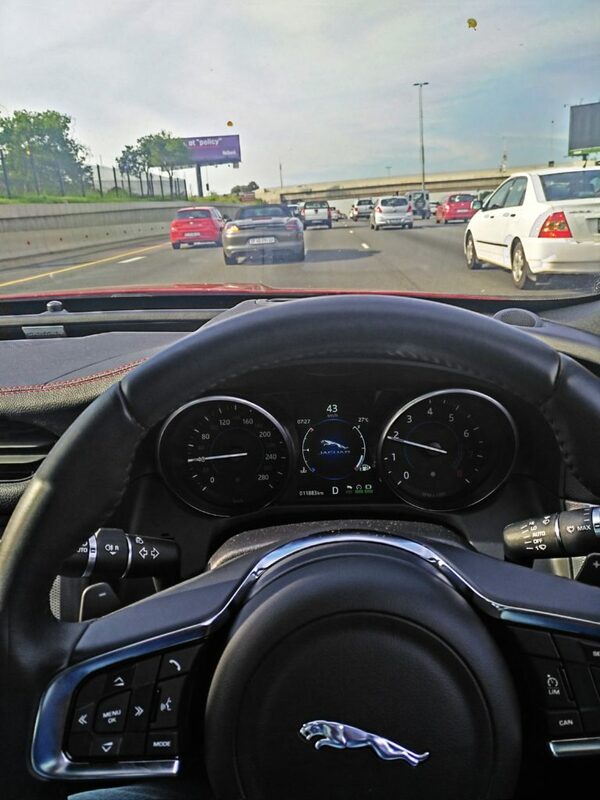 Admittedly, I like dialing the transmission over into sport mode and punching the little button with a checkered flag on it to put the XF into its most aggressive mode, but dialing everything down into soft mode still yields a sports car driving experience that might be too firm for a discerning luxury car buyer. But if the XF is too sporty for you, there’s always the full-size XJ line. Inside the new XF, Jaguar has done their homework. The cabin and controls are modern – but not pulled from some sci-fi design. You get plenty of real buttons along with a well-designed touchscreen interface in the center stack, and real gauges for tach and speed surrounding a small information display. You get a heads-up display on the windshield, though if you’re wearing polarized sunglasses you’re likely to miss that feature until night falls. One feature I like is real controls for the climate system. We’ve all experienced automatic climate control that never quite gives you what you want. Sometimes you want more than just a static 16 degrees – you want a good airflow of warm or cool air right now. The XF gives you a full set of controls that allow you to tailor not only the temperature, but how and where the system gives it to you. You also get heated and cooled front seats, which is a little bit of heaven. The front seats are completely power-adjustable – eight ways, in fact. The bolsters might be a little tight for larger individuals (myself included) but they’re adjustable to fit the broadest possible range of African sizes. The thing to notice about the XF’s interior is that it manages to pack the features in while remaining clean and uncluttered. The 8-inch standard touchscreen offers eight useful buttons that get you most of the way to the controls you want to use for the stereo, navigation, and phone services. The 10.2-inch upgrade touchscreen has no buttons – it’s all on the screen. The touchscreen and its systems are known as Jaguar InControl Touch, and that system is what Jaguar is offering instead of Apple CarPlay and Android Auto, at least for now. It’s got voice control, and will read your text messages intrusively out loud to you. The screen also supports standard tablet gestures like pinch-to-zoom and swipes, and you can choose what app icons are displayed. There’s even a phone app that allows you some remote control over the car. You can pre-condition the XF to a temperature, check fuel level, get alarm warnings, and it will even use GPS to lead you back to where you parked your car. On the road the XF is quiet, but not too quiet. This is no Rolls Royce you’re driving, so you want some engine noise, and the Jag delivers that when you romp on the throttle. But it’s not so loud that you can’t hold a civilized conversation, or enjoy the truly excellent Meridian sound system. 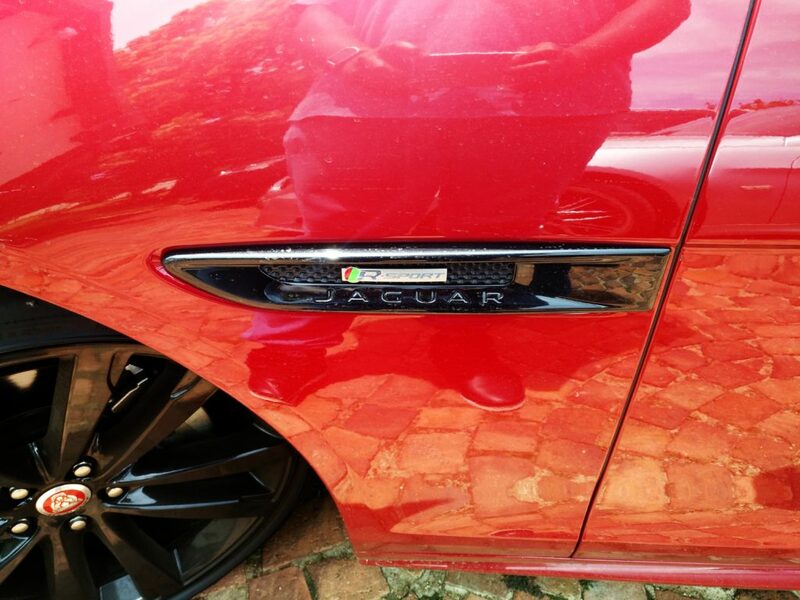 The 2016 Jaguar XF starts at R765 000. For that money you get a rear-wheel-drive sports luxury sedan with 340 horsepower and Xenon HID headlights. You also get the Meridian stereo, the base InControl system, backup camera, and a bunch of other features. This is no loss-leader, and probably the best value of the line. Moving up to the Prestige trim, you start at R802 000, and that buys you heated leather seats and wheel, navigation, and both front and rear parking cameras. The R-Sport trim gives you a body kit, LED headlights, some driver safety features (lane keeping, reverse traffic, driver condition, and blind spot) and it starts at R838 000. 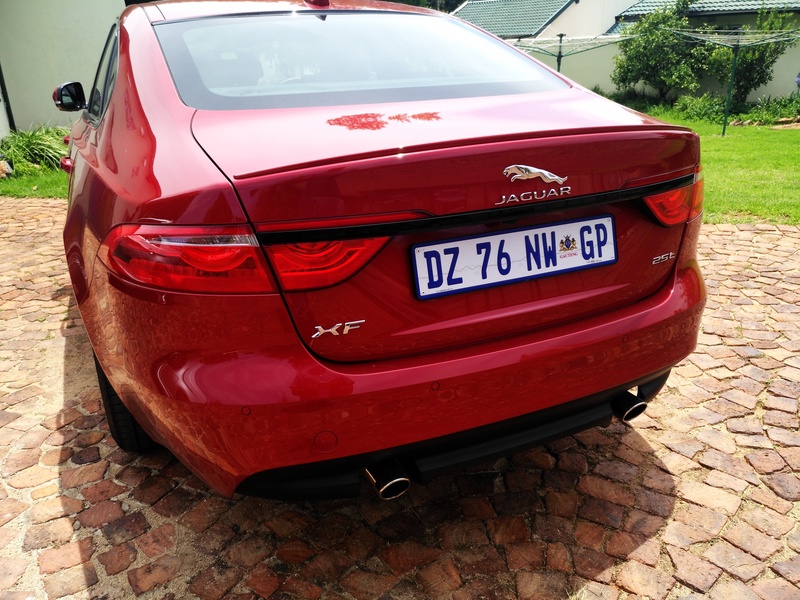 You can expect to add R25 000 to any XF model for all-wheel-drive. That’s worth the expense for most people in the Free State. The bottom line on the 2016 Jaguar XF is that it’s everything you expect from a Jag, and it’s reasonably priced for what you get. This car will compete strongly against the Germans, the Swedes, the top-level Japanese cars, and Cadillac. If you’re shopping in that market, you should test drive the XF and make your own short list.